The Hartford tungsten carbide ring is an ultra cool band which features eight brilliant round diamonds and a rich inlay of 18k rose gold. The 18k reddish color stands out from the crowd and is guaranteed to get you noticed. The 8 brilliant white diamonds is a guaranteed show stopper! 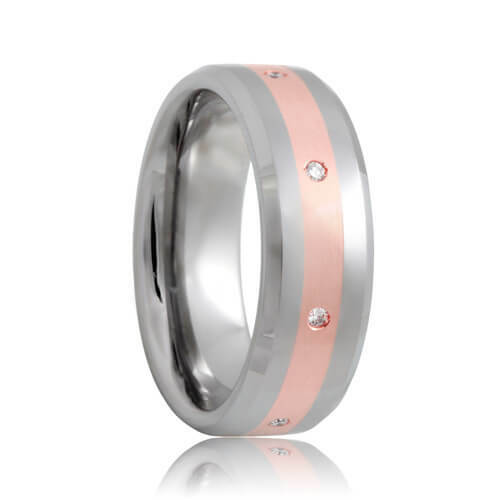 Rose gold is quickly becoming a new trend in tungsten rings. This ring features a beveled profile and highly polished edges to reflect the perfect amount of light. This style is made to order so please allow 5 - 10 business days to manufacture and ship. Free Lifetime Warranty and Lifetime Sizing; pay no restocking fees or deductibles!